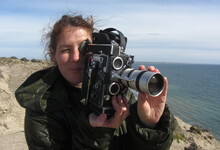 Argentine-British artist filmmaker, Jessica Sarah Rinland has exhibited work in galleries, cinemas, film festivals and universities internationally including NYFF, BFI London Film Festival, Rotterdam, Oberhausen, Edinburgh International Film Festival, Bloomberg New Contemporaries and Somerset House Galleries. She has won awards including Primer Premio at Bienale de Imagen en Movimiento, Arts + Science Award at Ann Arbor Film Fetisval, ICA's Best Experimental Film at LSFF, and M.I.T's Schnitzer prize for excellence in the arts. She has received grants from Arts Council England, Wellcome Trust, Elephant Trust and elsewhere. Residencies include the MacDowell Colony, Kingston University, Locarno Academy and Berlinale Talents. She is currently an Associate Artist at Somerset House Studios and a Film Studies Center Fellow at Harvard University.